Photo by Tony Mould: click on the photograph to open a large version in a new window. The first standard public telephone kiosk introduced by the Post Office was produced in concrete in 1920 and was designated K1 (kiosk number 1). 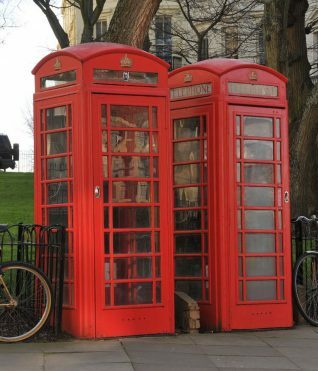 This design was not of the same family as the familiar red telephone boxes; very few examples remain. In 1935 the K6 (kiosk number six) was designed by Sir Giles Gilbert Scott, to commemorate the Silver Jubilee of King George V. The kiosks were made in cast-iron, with domed roofs. They have unperforated crowns to the top panels, and margin glazing to windows and doors. K6 was the first red telephone kiosk to be used extensively outside of London, and many thousands were deployed in virtually every town and city. It has become a British icon, although it was not universally loved at the start. The red colour caused particular local difficulties and there were many requests for less visible colours. The red that is now much loved was then anything but, and the Post Office was forced into allowing a less strident grey with red glazing bars scheme for areas of natural and architectural beauty. Ironically, some of these areas that have preserved their telephone boxes have now painted them red. We never had a phone at home so used these boxes regularly, there would sometimes be a queue of people outside the box waiting to make a call, quite intimidating if you were inside. And of course they had phone books inside so you could find people’s phone numbers to ring. Sadly in later days boxes became vandalised, books stolen and phone cords cut. Pressing button A or B was a normal action we all knew about. How the world has moved on from those days.